ABOVE: The Port de Javel Bas faces a large public park, the Parc André Citroën, where you can ascend 150 meters in a tethered sightseeing balloon for aerial views of Paris. 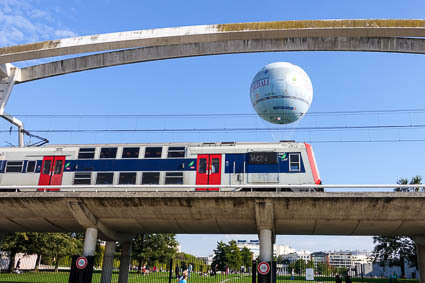 To reach the balloon, just walk under the RER train tracks and look for the ticket office on your left. Most Paris cruise itineraries offer a day and night in the city, and you'll nearly always have time for a bit of do-it-yourself sightseeing on embarkation day. The directions on this page are intended to help you find your way around when you aren't on an organized tour. Walk toward the Eiffel Tower from either port. As you stroll along the Seine, you'll pass lumberyards, yacht clubs, waterside cafés, moored sightseeing vessels, and houseboats. As you continue walking on the riverside promenade, you'll see paved access ramps leading up to the city's bridges and boulevards. Take any of these and go sightseeing on the Left Bank or across the Seine on the Right Bank. Tip: A decent map will make it easier to keep your bearings. We like the free maps from the Paris Tourist Office and the Printemps department store. The inexpensive "Paris Plan Eclair" pocket street atlas is even better. You can simply follow the directions on our previous pages in reverse to catch an RER train at Champ de Mars-Tour Eiffel or Boulevard Victor-Pont du Garigliano. 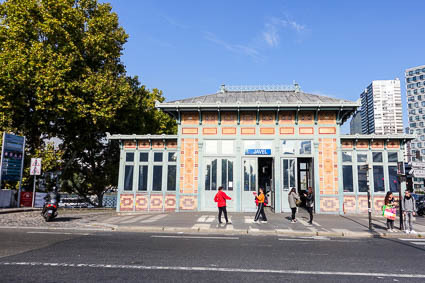 Or, if you prefer, you can walk to the Javel station of RER Line C (shown above), which is midway between the two ports by the Pont Mirabeau. Read our Paris RER "how to" article and consult the RATP transit authority's official RER map to plan your outing. Tip: You can change from the RER to the Métro (or vice versa) at official transfer points without buying a new ticket. This makes it easy to get around the city by rail. 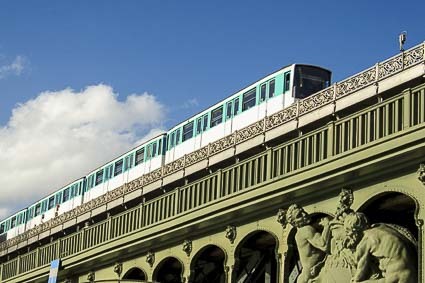 From the Port de Grenelle, it's an easy walk to the Bir-Hakeim station of Métro Line 6, which runs to Charles de Gaulle-Étoile at the top of the Avenue des Champs-Élysées. From the Port de Javel Bas, you can reach the Balard stop of Metro Line 8 on foot. From either port, you can walk along the boulevard above the Seine to the Javel-André Citroën station of Metro Line 10, slightly inland from the Javel station of RER Line C.
To view RER stations, Métro stops, and walking routes, see our full-page customized Google satellite map of the port area, which will open in a new browser tab. On the map, RER stations are marked with colored markers and "RER" symbols, while Métro stations are marked with "M" symbols. 3rd photo copyright © iStockphoto/Breigouze.